Holidaymakers have rated the Bondi to Coogee coastal walk as the second most popular Sydney attraction on review site Trip Advisor, beating the Opera House and Harbour Bridge. 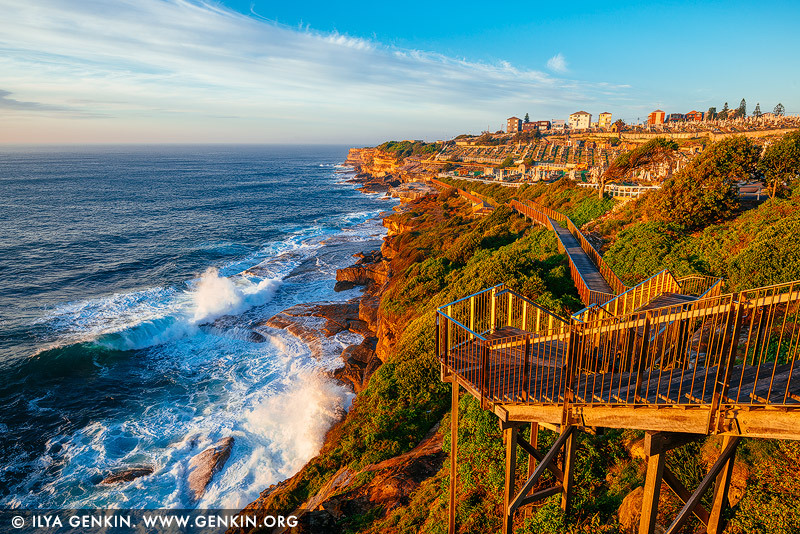 A cliff top coastal walk, the Bondi to Coogee walk extends for six km in Sydney's eastern suburbs, featuring stunning views, beaches, parks, cliffs, bays and rock pools. It takes in beaches at Tamarama, Bronte, Clovelly and Gordon's Bay. The Bondi to Tamarama Beach section of the walk is transformed each spring with the Sculptures by the Sea exhibition. This image belongs to the travel and nature stock photo library. This stock photo of Bondi to Coogee Coastal Walk at Sunrise #2 is available for licensing for commercial and editorial uses including websites, blogs, books, magazines, brochures and advertising. Restrictions may apply for images which contain third party copyrighted material or sensitive subjects. Photos of artwork are for editorial use only. This image id AU-BONDI-TO-COOGEE-WALK-0002 of Bondi to Coogee Coastal Walk at Sunrise #2, is copyrighted © by Ilya Genkin. This is not a public domain image.